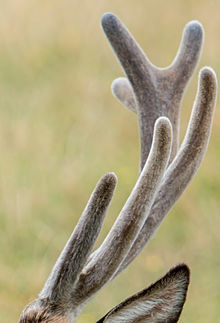 In the West, velvet antler is dried, powdered, and consumed in encapsulated form or via aqueous alcohol extract as a dietary supplement, for which it is monitored for potential manufacturing and advertising violations by the US Food and Drug Administration and the Federal Trade Commission. A review published in 2012 summarized results from clinical research, including three studies on sports performance: "Claims that velvet antler supplements have beneficial effects for any human condition are not currently supported by sound clinical data from human trials." In September 2011 S.W.A.T.S lost a lawsuit for 5.4 million dollars concerning a NFL athlete who had tested positive for methyl testosterone. In early January 2013 an NFL athlete was accused, by the owner, of taking S.W.A.T.S. deer antler spray for an injury who further failed to provide proof and made a formal apology. ^ a b c Joseph Matrisciano, Jr. (19 April 2017). "Warning letter: Tobin's Royal Stag, Inc. dba Tobin Farms Velvet Antler". Inspections, Compliance, Enforcement, and Criminal Investigations, US Food and Drug Administration. Retrieved 6 April 2018. ^ Gilbey A, Perezgonzalez JD (2012). "Health benefits of deer and elk velvet antler supplements: a systematic review of randomised controlled studies". N. Z. Med. J. 125 (1367): 80–6. PMID 23321886. ^ Nicholson (2015-9-18). Singh admits using deer antler spray, says he was unaware it was banned. . pga.com. ^ Galloway D (2013-09-05). "Sports Performance Company Ordered to Stop Selling 'Deer Antler Spray,' Other Products". WHNT. ^ Otano J (2013-09-05). "Ray Lewis' alleged deer antler supplier has office raided in Alabama". SI.com. Archived from the original on 2013-09-11.